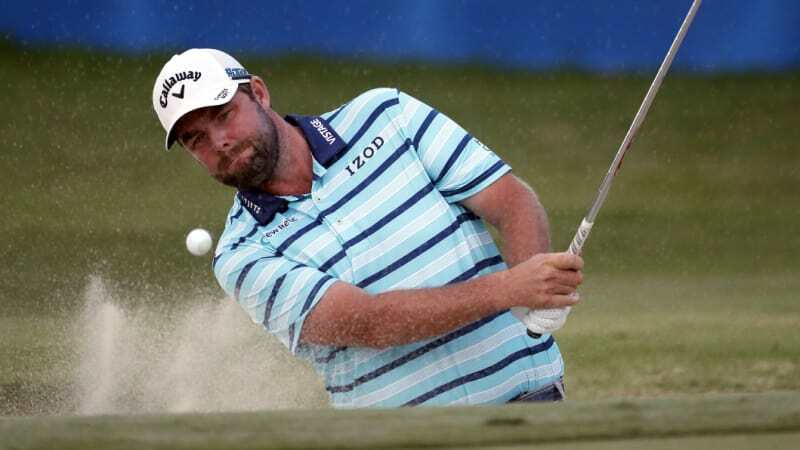 Super-consistent Marc Leishman is on track for another big US PGA Tour payday but the Sony Open title appears almost out of reach going into the final round. The Australian shot a two-under 68 third round to get to 11-under at Waialae Country Club in Honolulu on Saturday. But he remained tied fifth – as he had started the day – with American leader Matt Kuchar (66) now seven shots in front of him after getting to 18-under 192, the lowest 54-hole score of his career. Chasing his eighth title and second of the season, 40-year-old Kuchar leads by two shots from Andrew Putman (67) with countrymen Keith Mitchell (63) and Chez Reavie (66) a further two shots back. Leishman is next, in a tie with eight other players including fast-risers Bryson DeChambeau (63), Davis Love (64), Charles Howell (64), Dominic Bozzelli (64) and Brian Stuard (64). Leishman is coming off a tie for fourth at the Tournament of Champions in Maui last week after starting his US tour season with a victory in the CIMB Classic in Kuala Lumpur, tied 18th at the CJ Cup at Nine Bridges in South Korea and tied second at the World Cup in Melbourne alongside Cameron Smith. Kuchar has also been in fine form after ending a three-year title drought by winning the Mayakoba Classic in Mexico late last year. The other two Australians at the tournament, Adam Scott and Cameron Davis, missed the cut on Friday.